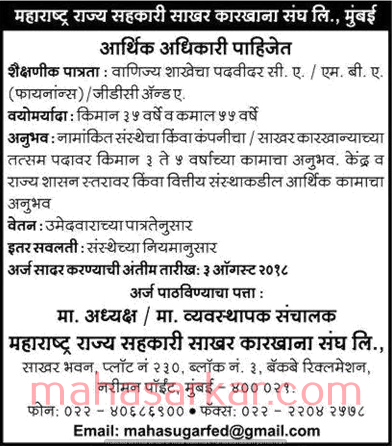 Maharashtra Rajya Sahakari Sakhar Karkhana (Maharashtra Rajya Sahakari Sakhar Karkhana LTD), Mumbai Published Job Notification for Financial officer Posts. Candidates who wish to apply must look at Maharashtra Rajya Sahakari Sakhar Karkhana Financial officer Recruitment 2018. Eligible candidates can apply Offline before 03-08-2018. Education Qualification: Commerce graduate C.A./ M.B.A. (finance)/ G.D.C. & A and More. For Post wise Education Details follow the detailed advertisement. Age Limit: 35 to 55 years. Interested & Eligible candidates can send their application along with all the necessary documents and testimonials to मा. अध्यक्ष, महाराष्ट्र राज्य सहकारी साखर कारखाना लिमिटेड, साखर भवन, प्लॉट नं. २३०, नरीमन पॉइंट, मुंबई- ४०००२१. Starting Date, Last Date to Apply Offline at Maharashtra Rajya Sahakari Sakhar Karkhana LTD which candidates should be remembers as follows. Start Date to Apply Offline: 25-07-2018. Last Date to Apply Offline: 03-08-2018.